With the ever changing beauty rules it is extremely difficult to know what is correct. Our Beauty by Numbers post strives to answer some of the most baffling beauty questions. Read on… some of the answers will surprise you! 1. How long does it take for the nail polish to dry and become smudge proof after my manicure? A typical manicure usually consists of a base coat, two coats of colour and a clear top coat. For every coat you paint on your nails you need five minutes drying time under the nail dryer. If you don’t have a spare 20 minutes consider having a Shellac Manicure done as it is zero drying time. 2. How many times can you use dry shampoo in between washes? Dry shampoo is overused. Limit it to three times before washing your hair. Otherwise the powder will become visible to the naked eye. 3. How often should I switch my foundation? By regularly swapping your foundation the shade and formula will always match your skin texture and colour perfectly. Our skin changes constantly due to seasonal, environmental, hormonal and lifestyle factors. 4. How long should it take before I see results from my anti-ageing cream? You must take into account the severity of the skin condition you’re trying to fix. If you’re committed to a twice-daily skincare regimen, you should see improvements within 90 days. 5. How often should I clean my make-up brushes? Regular cleaning will remove trapped make-up residue and kill any bacteria. Wash your brushes in shampoo and rinsing them well before placing them out flat on a clean soft towel to dry. 6. How often long should I wait for my sunscreen to absorb before heading outside? This allows the sunscreen absorb into your skin. Always use a sunscreen with a protection factor SPF30 (or higher) and reapply every 2 hours. Always wear a sunscreen, as ultraviolet rays damage skin and contribute to skin problems. 7. 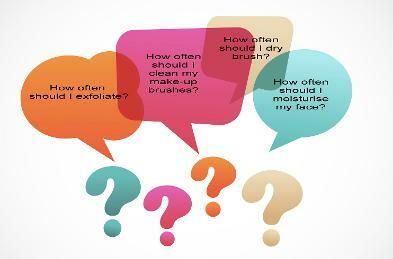 How often should I exfoliate? Regular exfoliation not only cleans up your pores but gentle buffing can also help to minimize fine lines and wrinkles. Removing dead skin cells from your face and body allowing your serums and moisturisers to do their job. 8. How often should I moisturize my face? Once in the morning and once before bed. However, if you are finding that your skin is still thirsty, try using a hydrating serum in conjunction with your moisturizer to properly restore moisture to your skin. If that doesn’t improve your skin after 45 days, try using a different skin care line to see if that improves it. 9. How often should I have my eyebrows waxed? Answer: Every 4 weeks in summer and every 4-6 weeks in winter. Whether you are booking in for a complete brow tint tidy and reshape or just a brow wax, you will not only feel more polished afterwards but your eye makeup application will be flawless. A professional eyebrow session is the quickest way to improve your brow shape and flatter your eyes. 10. How often should I dry brush my body? Dry brushing daily will help to increase your circulation, soften your skin and help to remove toxins. Always dry brush before your get into the shower starting at your feet and working upward strokes towards your heart. 11. How often should I replace my mascara? The core ingredients in mascara only has a 3 month life span, so after 3 months they will start to dry out and not coat your lashes properly. Bacteria also breeds inside the tube so you want to discard it regularly. 12. How long should I leave my serum to absorb into my skin before applying my moisturizer? It is essential to allow serum to properly absorb this way the active ingredients can penetrate the skin without interference. Wait until the serum is no longer felt on the skin before applying your moisturiser – this usually takes approximately 2 minutes (depending on skin type). Wait approximately 5 minutes before you apply your foundation.